I’m currently debating changing the name of a major, albeit non-speaking, character in the manuscript my agent is about to begin marketing. This is something I’ve been considering for more than a year, so this isn’t last minute scrambling and tweaking (well, it is, but the decision has been floating around my brain for a while now). It’s a big change because I’m also changing the name of the book. To the name of this character. Changing the name of a character is a very weighty decision, but knowing I’m changing this name to the title of the book is huge. Can this character carry it? Will this change people’s expectation of the plot once they’re introduced to the character, knowing that is the title of the book. To be fair, the title also refers to a few other things, not just this character, but it still could have a major ripple effect. On paper, all it is is changing one two-page scene and doing a search and replace on the old name and new name, but in terms of the spirit of the book and people’s reaction to it, it’s so, so much more. Well, to be honest, this probably comes after chocolate and some tv shows. Hm, no, it probably does NOT come after tv shows because I usually do this while watching tv. This addiction is crocheting. I crochet something for Wyrmling every month. For her first year, it was hats. After she got over a dozen hats, which she hated wearing anyway, it seemed prudent to switch to something else. I’d made a Noah’s Ark and filled it with finger puppets for a good friend’s child, so I thought making one for Wyrmling and adding a finger puppet set a month would be fun. I don’t want this to become a crochet blog, but I am posting about this because it does come back to my writing. This month I decided Wyrmling’s Ark needed some unicorns. There are some legends of unicorns not making it onto the Ark (a legend that I actually work into my book “Tapestry Threads”), so I like the idea of making some that actually did catch the boat. I made some basic ones from this pattern for my friend’s child’s Ark (there isn’t a unicorn pattern, which is odd because it’s fairy tale puppets, but it’s easy to add a horn). My crochet skills have improved since I made these, though, so I decided to mix things up on the new ones, using the same pattern. 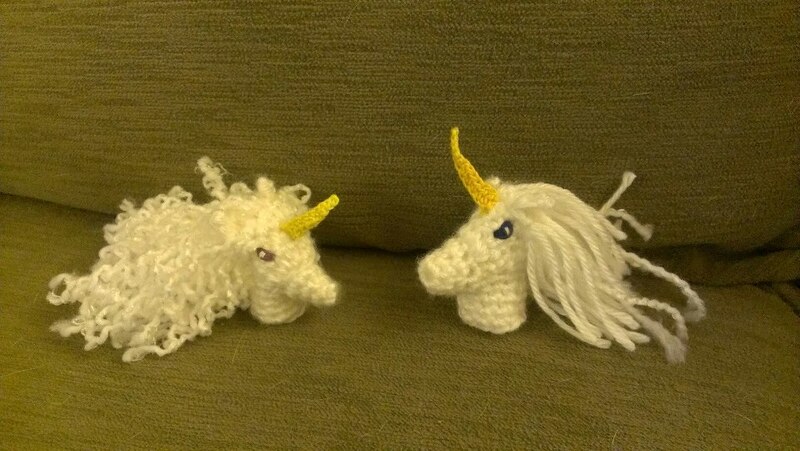 I used a basic worsted weight yarn, which I use for most toys, for the two unicorns. I used different sized hooks, however, to make the male a smidge bigger. Also, instead of yarn for the horns, I used embroidery floss. I thought I had some gold, but then I remembered I used it all making a Golden Snitch. I settled for two different shades of yellow, and then used embroidery floss for the eyes (purple on one, dark blue on the other). 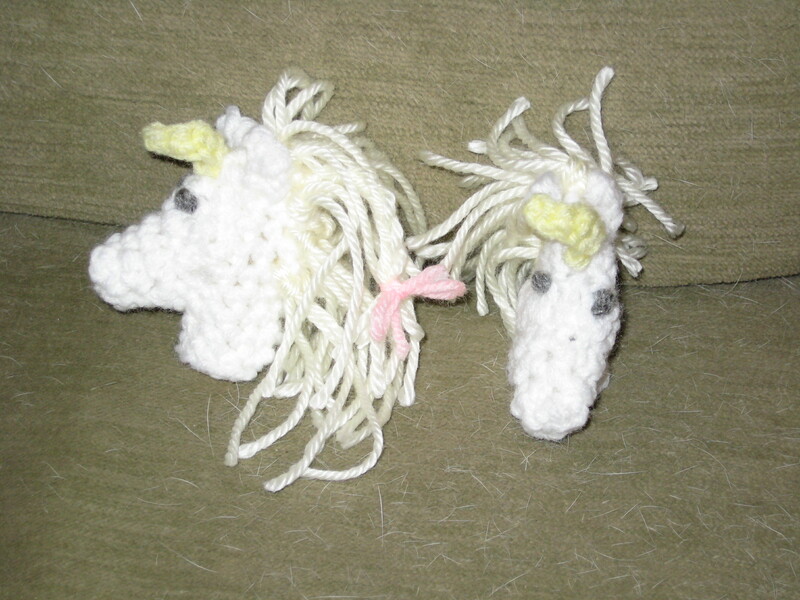 For the male’s mane I used the same yarn as the bodies for both unicorns. For the female’s, I wanted something different. I debated unraveling some of the same yarn to give it a wavy look, but I ran out of that yarn. I then started looking and I found a flower I’d debated putting on a hat for Wyrmling, but wasn’t quite happy with. It was a white yarn with a pearl thread to it, so I thought that would look nice. When I started unraveling the flower, I had a happy surprise! From being crocheted for so long, it now had a permanent kink to it, so it was the EXACT look I wanted for the unicorn (well, I hadn’t counted on how much it looked like a member of an 80s hair metal band. Dee Snyder and Brett Michaels, perhaps?). Resemblance to 80s rockers aside, I’m rather pleased with how these turned out! If Wyrmling doesn’t play with them, I use them for enacting scenes from my book. Since I work from home (a rather boring, non-writing job that thankfully pays the bills until I become the next J.K. Rowling) with a toddler, I don’t have a lot of writing news these days. I was trying to think of something interesting to put here and realized that something that has taken over my brain for the past year is actually a good topic for writers. And that is the creation of a writing space. A space to write is very important for a writer. It can be as simple as going to a coffeeshop regularly to write, or it can be as involved as building a writing cottage. I hate coffeeshops (the smell makes me sick and I don’t like crowds or having to haul computer and set it up) and we’re a long ways away from being able to do a writing cottage, so I land squarely in the middle: a designated room for writing. Due to room limitations (we don’t have a mansion, alas!) 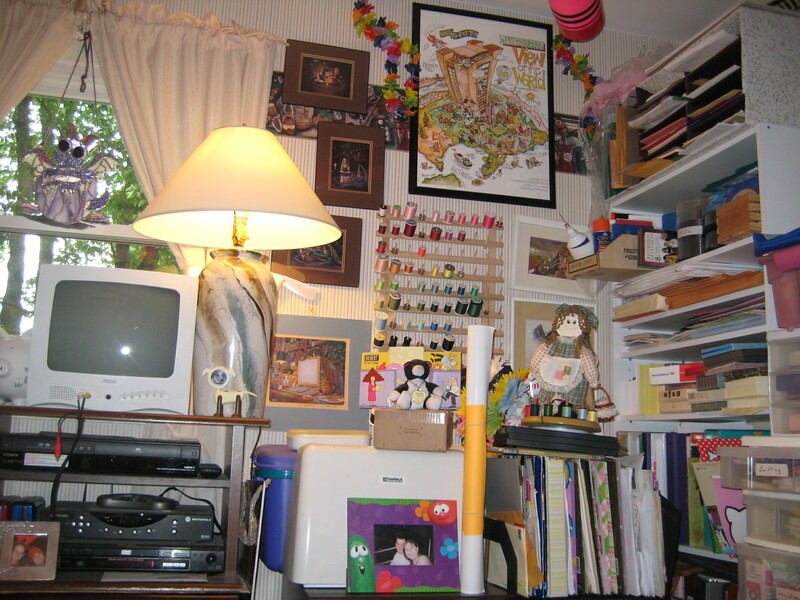 my writing space has to share a room with my work space and craft space. 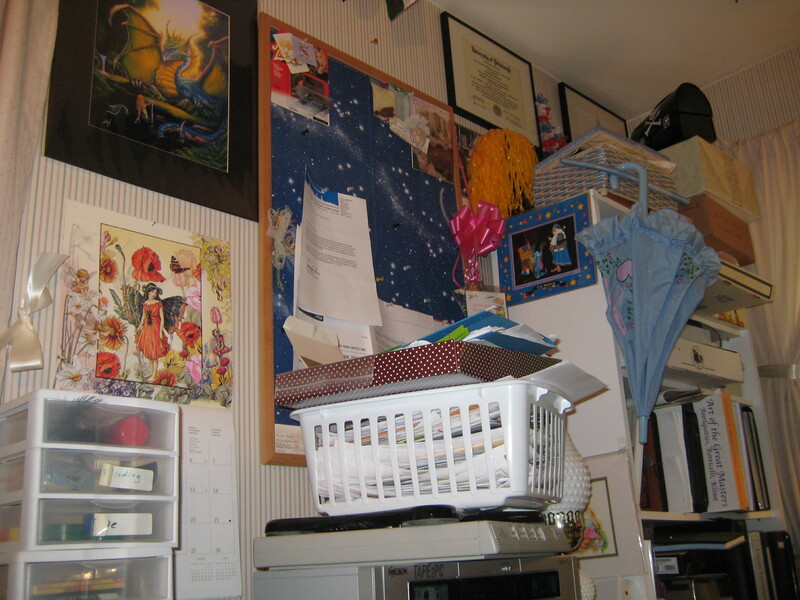 When I moved into my husband’s house, I took over his office. That made sense, since I’m the one who works from home. 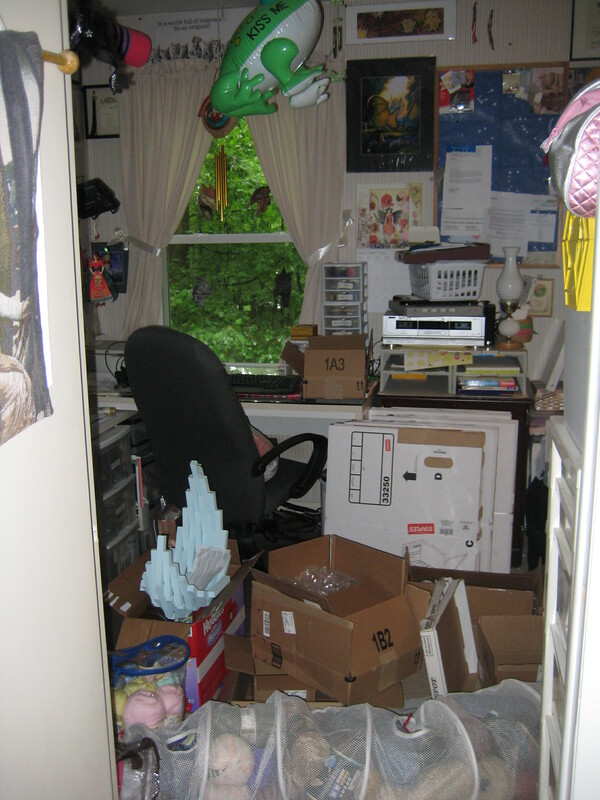 I, however, decided to ignore his advice of fixing the room first and opted to move all my junk in immediately. This resulted in me staring at golf wallpaper for five years (not my husband’s choice, from the previous owners). This was cramped, because I was basically fitting one full-time job, one part-time job, and multiple crafts into one room, but I made it work. When Wyrmling started getting mobile, I realized it was nowhere near childproofed and the time had come for a major overhaul. Over the next few weeks I’ll be chronicling our journey through office renovation (which is, mercifully, drawing to a close). I should have taken more before pictures, but here are a few. These were all taken May 14, 2012. So yes, this project has taken 9 months and counting. In our defense, we were also doing a couple other outdoor projects that had to be done during good weather, plus this room is directly across the hall from Wyrmling’s room, so work when she’s asleep is completely out. This was taken after I started packing, so no, I did NOT work with all that stuff on the floor. The desk is about right, though. This is my organizational system, or lack thereof. That white plastic basket? That’s all “to be filed” things that landed there after Wyrmling was born because my file cabinets were crammed full. This gives you a slice of my hobbies, including sewing, stained glass (I made the dragon hanging in the window), and even a picture of my husband wearing a Jayne hat that I crocheted for him. Yes, there is a tv and dvd player in there because I LOVE working with the tv on. I’ve had to stop that, though, so Wyrmling doesn’t become a couch potato. I hope you enjoyed my mess confessional. Tune in next time for a good look at the previous owner’s decor, and my thoughts on decorating your writing space. 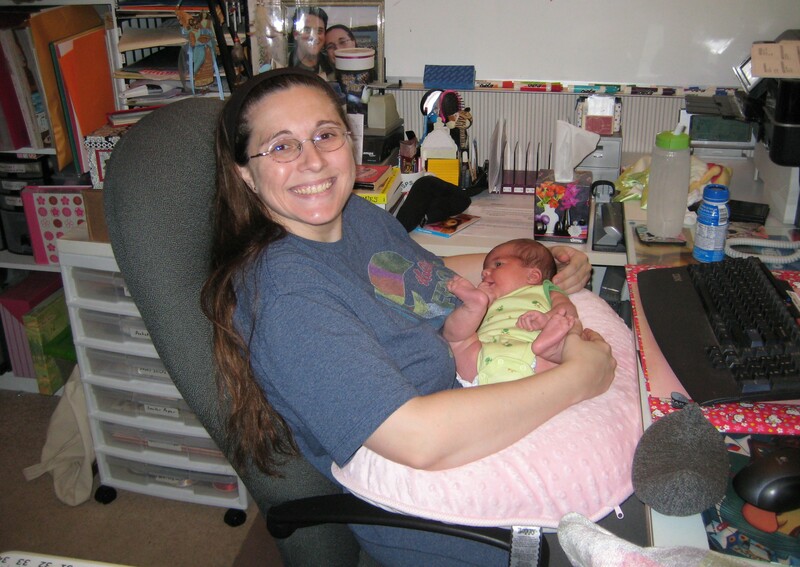 ETA: Found one of me at my workspace with Wyrmling when she was less than a month old! This picture was taken when Wyrmling was less than a month old! Aww! Ahem. In office news, you can see a large whiteboard on the wall. A friend rescued it from his work when they were getting rid of it, so I had a HUGE whiteboard in my office, which was SO nice for writing. I ended up deciding not to put it back in the office (it’s now hanging in the basement for Wyrmling to draw on) and will talk more about what I decided to do instead in a future post.